Did Shakespeare really use astrological symbolism in the creation of his marvelous works? Without doubt! 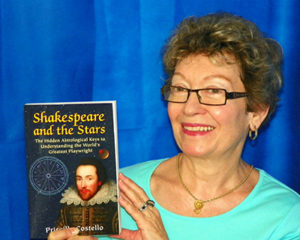 This readable, elegantly written, and thoroughly researched book explores the ways in which Shakespeare consciously employed the language of astrology and wrote from within the framework of the comprehensive worldview that included the spheres of the planets. Not only are there numerous direct references to the Sun, Moon, stars, planets, comets, eclipses, etc. in his plays, but he also modeled characters after planetary types (according to the “theory of the temperaments”). And most amazing of all, certain plays are “keyed” to a particular sign and planet. A Midsummer Night’s Dream, for example, is in the key of the Moon. Every set of characters mentions the Moon at first entrance, the Moon is a character in the playlet performed in Act V, and the main action of the play illustrates the changeability of love under the fluctuating light of the Moon. 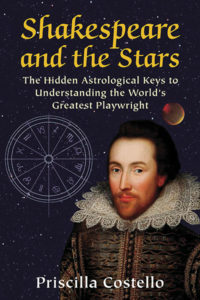 This book presents background to understanding Shakespeare’s works (particularly “the Elizabethan World Picture”), probes six of Shakespeare’s best-loved plays (A Midsummer Night’s Dream, Romeo and Juliet, The Merchant of Venice, Macbeth, The Tempest, and King Lear) to illuminate their astrological sympathies, and provides a unique and profoundly illuminating perspective on one of the world’s great creative geniuses. Ibis Press, 2016, 547 pages. Six e-books, condensed versions of the separate chapters on each of the six plays, will be available in 2017-18. Order from your local independent bookstore or from Amazon. PRISCILLA COSTELLO is a world-renowned astrologer, the author of The Weiser Concise Guide to Practical Astrology.